The fans celebrate along with Alex Tuch of the Vegas Golden Knights during the Stanley Cup playoffs. It was a Cinderella season for the newest team in the NHL. As my cab drove down the Las Vegas Strip, I noticed a new palette of colors standing out against the bright pools of neon so famously associated with Sin City. Patches of black, gold, steel gray and red were everywhere, on T-shirts, on hats and on the billboards of local businesses. The colors are the symbol of the new pride of Sin City and the biggest Cinderella story in all of sports—the Vegas Golden Knights of the National Hockey League. The Knights have matured from the NHL’s newest desert experiment into the hottest ticket in town. Even if you don’t follow the NHL, you’ve probably still heard of the team’s unlikely success. The Golden Knights played their first game ever on October 6 (a victory), and went on to amass one of the best home records during the NHL’s 2017–2018 regular season, winning the Pacific Division. They swept the Los Angeles Kings in the first round of the NHL playoffs, beat the San Jose Sharks in the second round and then defeated the Winnipeg Jets to earn the right to play for the Stanley Cup against the Washington Caps. Although Vegas fought hard in the Cup Final, they lost in five games. Still, expansion teams just aren’t supposed to be this good, this fast. Can you imagine a first-year Major League Baseball team in the World Series? An NFL team playing in the Super Bowl in its inaugural season? An expansion NBA team making it to the championship? No team in those leagues has ever played in the big game in their first year. And in hockey, you have to go back 50 years—all the way to the 1967–68 St. Louis Blues—to find an expansion NHL team with comparable success to the Golden Knights. But even that comparison falls flat, because the Blues were one of six teams added to the league that year, all of which were put in the same conference, and in those days only four teams in each conference made the playoffs, so the Blues (who were swept in four games in the Stanley Cup Finals) faced a much easier path. Simply put, the Golden Knights have done better in year one than any pro sports team in history. And the people of Sin City absolutely love them. Vegas’ embracement of the only local major league sports team in town (until the Raiders arrive in 2020) wasn’t subtle. After all, this is Las Vegas, where you go big or go home. In April, just as the Golden Knights were beginning their historical playoff run, the New York-New York Hotel & Casino draped a Golden Knights home jersey over its 150-foot replica of the Statue of Liberty. Farther down the Strip, a Vegas Golden Knights rally flag was placed in the outstretched hand of the Augustus Caesar statue in front of Caesars Palace. During a visit to Vegas, I set out to find out why the city in the desert so closely associated with gambling, vices and conferences fell so quickly in love with its new toy. A bartender offered a different reason, one that’s a little deeper. The Golden Knights home-opener was October 10, 2017, only nine days after the tragic Mandalay Bay mass shooting in which 58 people were killed. Recognizing that Las Vegans were grieving and in dire need to heal emotionally, the players wanted to do something to help. So they reached out to first-responders and families affected by the tragedy. During the pregame ceremony of the Knights’ first home game, the players were each escorted out to the ice by a first-responder. The names of the victims were emblazoned onto the ice, and a 58-second moment was held to honor those who lost their lives. The team even went so far as to retire jersey No. 58. 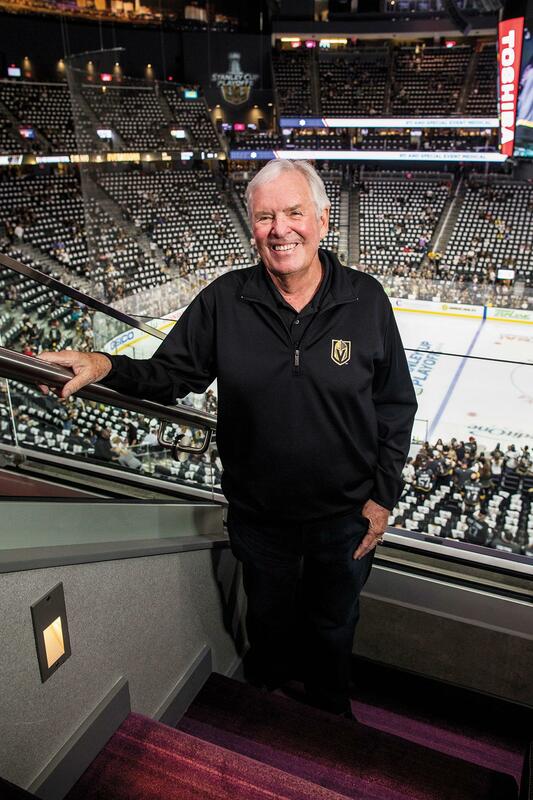 Team owner Bill Foley above the home ice at T-Mobile Arena. The Golden Knights have endeared themselves to the local community in other ways as well, particularly in their practices, which have become something of legend. The team works out in a new $30 million, 146,000-square-foot rink called City National Arena, also located in Summerlin. Whereas most NHL teams practice with perhaps a few fans onlooking, anywhere from 500 to 1,000 energetic fans routinely visit the rink (admission for practice is free of charge) to cheer and watch their Golden Knights participate in drills. On the day that I visit, I’m sitting next to a father and mother with three kids. All are wearing some sort of Golden Knights gear, and the children are each holding knee-hockey sticks. While the dad was a hockey fan even before the Golden Knights came on the scene, it was hard to get his kids into the sport. “Now that they have an NHL team they can watch every night, they are fans,” he says, with a big grin. His son rattles off his favorite players while he watches them intently. Moments after the practice ends, one of the players skates off the ice. Instead of heading to the locker room, he walks straight to a crowd of young fans to sign autographs. Around 30 kids are there, and the player doesn’t leave until he has signed for each one. In fact, he wants to give a lucky kid his stick. Wanting to spread the love around, though, he breaks his stick in two to hand a piece to two kids. Their eyes light up. Later that night, I’m at Game 5 of the Golden Knights second round playoff series against the Sharks. The pregame inside T-Mobile arena, simply put, is the best I’ve ever witnessed at a hockey game. A $1 million LED light setup in the rafters flashes images of the players to the ice as 18,000 screaming fans wave white towels. Then the lights darken, and the crescendo of The Avengers theme song blasts through the arena’s speakers. The words “Vegas, Are You Ready?” appear on the ice and on the scoreboard (or the Knight Tron as it’s called). Suddenly, a skater dressed in black and holding a Sharks flag skates onto the ice. The crowd boos and hisses. On the other side of the ice, another actor, dressed in golden armor, skates out. The two then do battle, in a choreographed fight reminiscent of the shows put on at the Excalibur Hotel just up the street. The Golden Knight prevails, stabbing his sword into the enemy. The crowd erupts, and a sound meter on the Knight Tron hits 105 decibels. The building is literally vibrating underneath my seat, and I find it impossible not to get caught up in the energy. For most of the first period, the Golden Knights’ forecheck is relentless. The Sharks just can’t seem to find an answer, and the Knights just keep pressing their offense, wave after wave. Finally, with only seconds left in the period, forward James Neal slams home a rebound and the crowd noise following the goal is so loud I can’t hear the sound of the horn as the period ends. The team doesn’t stop there, eventually building a 4-0 lead. The screams get louder with each goal, and the Knights win 5-3. I honestly can’t remember having this much fun at a hockey game. Perhaps this is the ace up the sleeve of the Golden Knights. The organization has made the game of hockey fun for the fans, a great escape from their lives for three hours.